The Starry Skies in Ballarat are disappearing! The beauty of the night sky with its numerous twinkling points of light. Stars so far away that the distances seem intangible, yet we are able to enjoy the beauty they bring to the darkness that befalls us at night. Enjoying the mystery and enigma of the night sky is becoming a rare experience, as cities and towns grow, we flood our night sky with unnecessary light that washes out the magnificence of the night sky. Lighting is essential however, we must be aware and wise. Light pollution is one of the easiest forms of pollution to tackle, yet we disregard it as unimportant. Optical or Visual Astronomy is based on dark skies, without dark skies astronomers would have had a very difficult time understanding some of the mysteries of the Universe and our place within it. As we progress technologically and socially, we have sacrificed this precious scientific resource “Dark skies”. The French government has taken some giant leaps to help protect the purity of the night sky in Paris by imposing lighting restrictions requiring all offices and shops to switch off internal lights within an hour after the last worker leaves at night and most external lights will need to be off by 1 am. The idea is to save energy, to improve public health and to reduce adverse ecological effects, and allow the public to enjoy the beauty of the night sky from their homes. Imagine walking out into your backyard and being able to enjoy the full extent of the Milky Way. Most of us fail to see that the band of millions and billions of stars that stretches across the night sky can be seen from our homes if we did not have so many street lights. Astronomers and others who appreciate the glories of the natural night sky have certainly had a hand in these changes but the benefits go well beyond the reduction of artificial skyglow. Reducing the energy required for lighting makes sense. More can be achieved with outdoor light fittings that direct all their light down to where it is needed. Environment – the large blue component gives a greater contribution to sky glow than warmer coloured light. Ecology – the large blue component of the light has a disturbing impact on insects and on nocturnal animals. Visibility – due to the large blue component of the light extra glare is perceived from the street lights reducing visibility for all. This is especially the case for older people whose eyes are likely to have yellowing lenses so that much of the blue light does not reach into their eyes. Human health – blue light at night suppresses the hormone melatonin disturbing the normal human circadian rhythm as well as the immune system. There is now considerable evidence indicating that light at night, especially blue light, is a risk factor for breast and prostate cancer. CHICAGO – Strong arguments exist for overhauling the lighting systems on U.S. roadways with light emitting diodes (LED), but conversions to improper LED technology can have adverse consequences. In response, physicians at the Annual Meeting of the American Medical Association (AMA) today adopted guidance for communities on selecting among LED lighting options to minimize potential harmful human and environmental effects. Converting conventional street light to energy efficient LED lighting leads to cost and energy savings, and a lower reliance on fossil-based fuels. Approximately 10 percent of existing U.S. street lighting has been converted to solid state LED technology, with efforts underway to accelerate this conversion. The guidance adopted today by grassroots physicians who comprise the AMA’s policy-making body strengthens the AMA’s policy stand against light pollution and public awareness of the adverse health and environmental effects of pervasive nighttime lighting. 3. 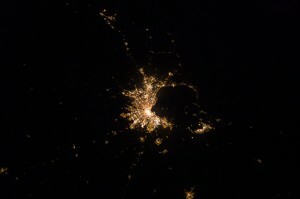 Image of Melbourne, Geelong and Ballarat (bottom of image) from The ISS taken in 2003.08.15 at 18:14:25 UT.